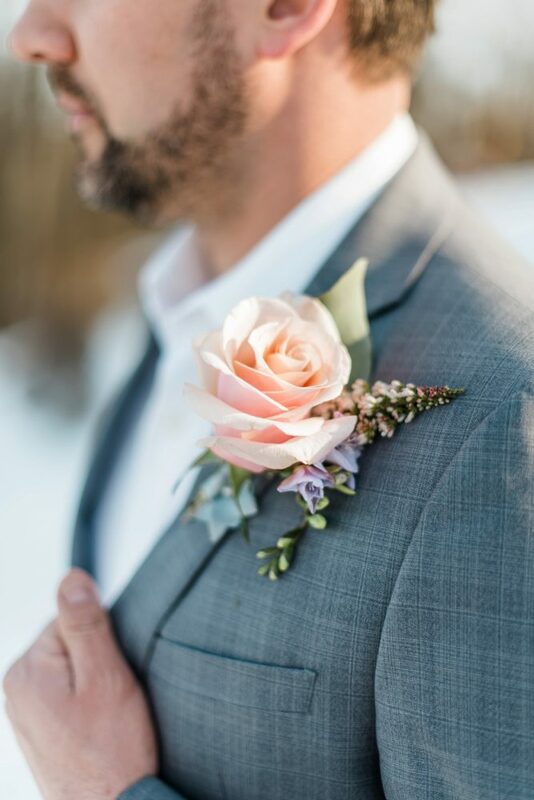 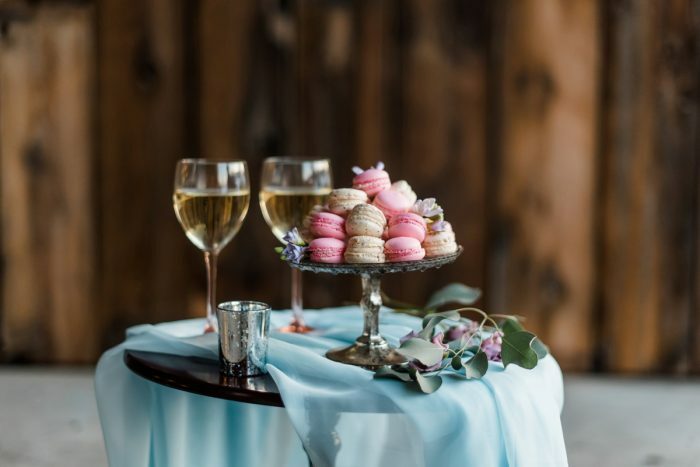 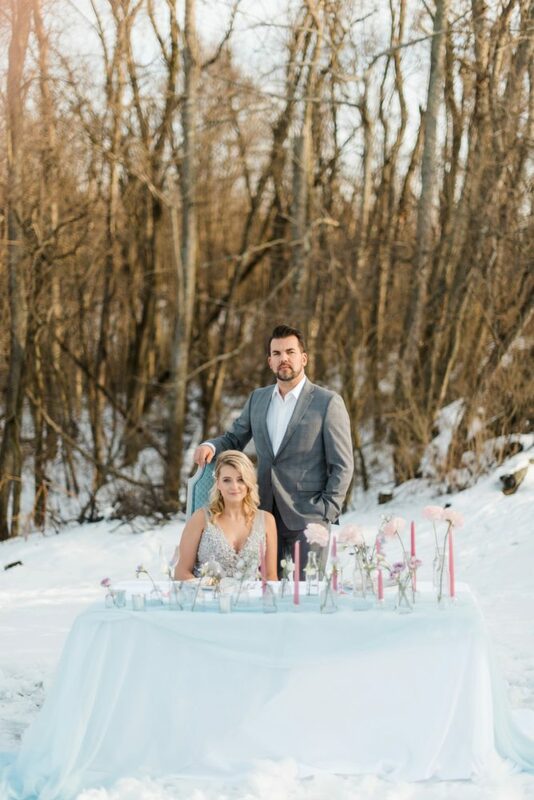 The pale pinks and blues of a gorgeous winter sunset inspired this styled shoot that will make all pastel wedding lovers go gaga! 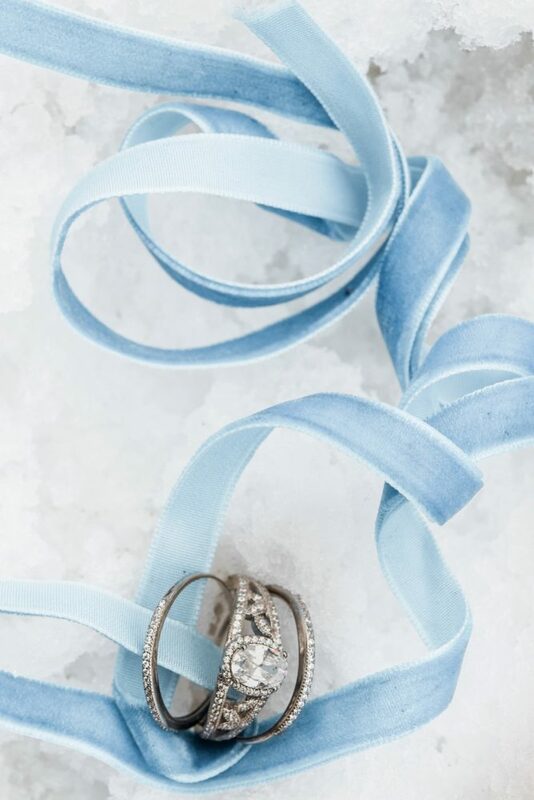 The light shades are a feminine contrast against the white snow of the season. 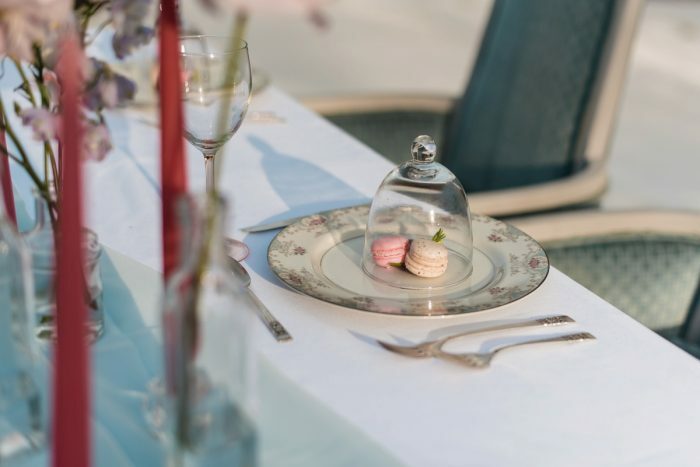 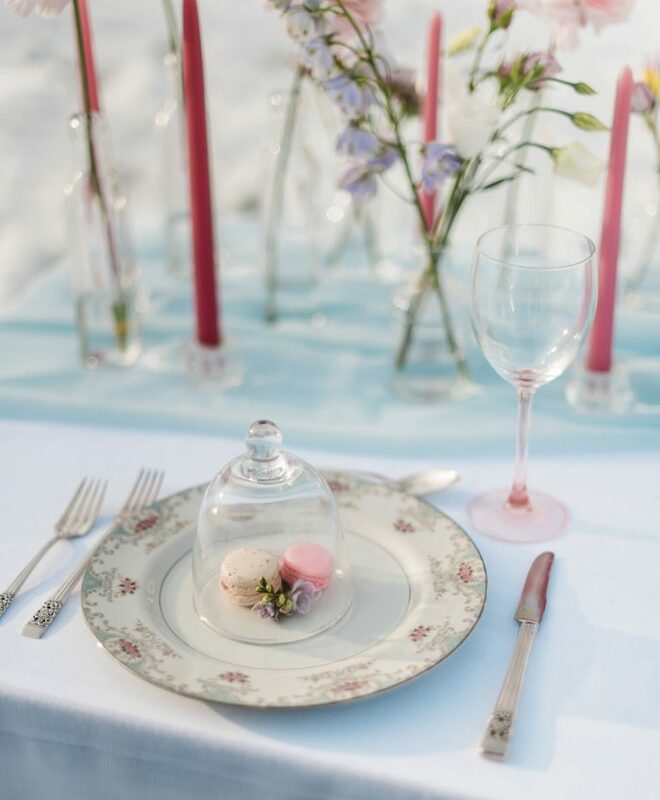 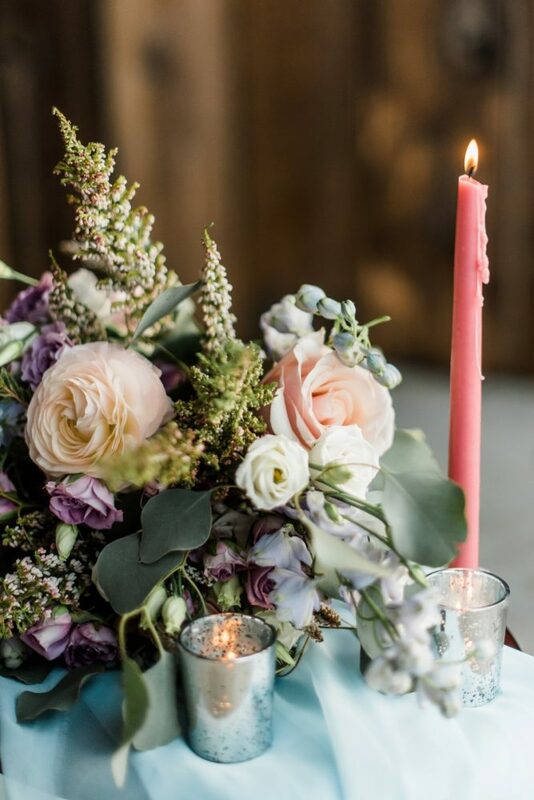 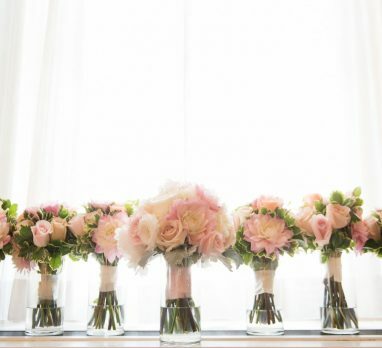 Taking place on Heaven Sent Farms, stylist Jessica Garda Events set up a sweetheart table dressed with airy fabrics, pink taper candles, and simple bud vases. 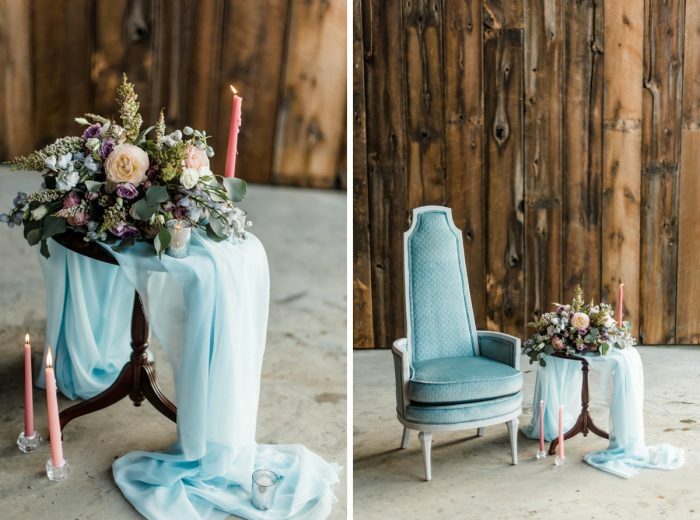 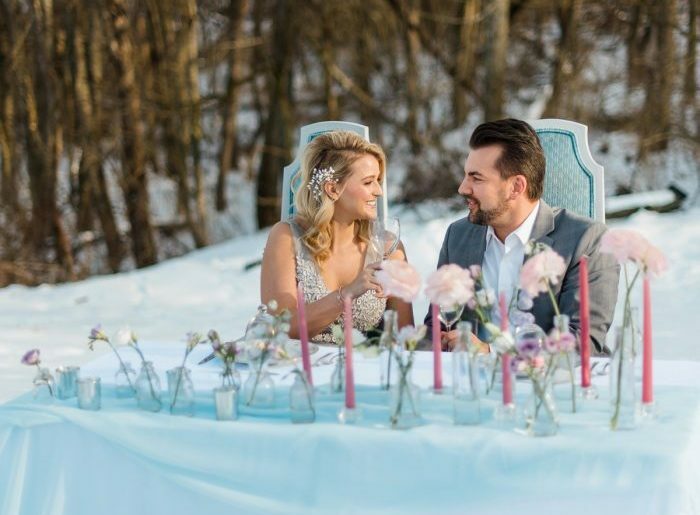 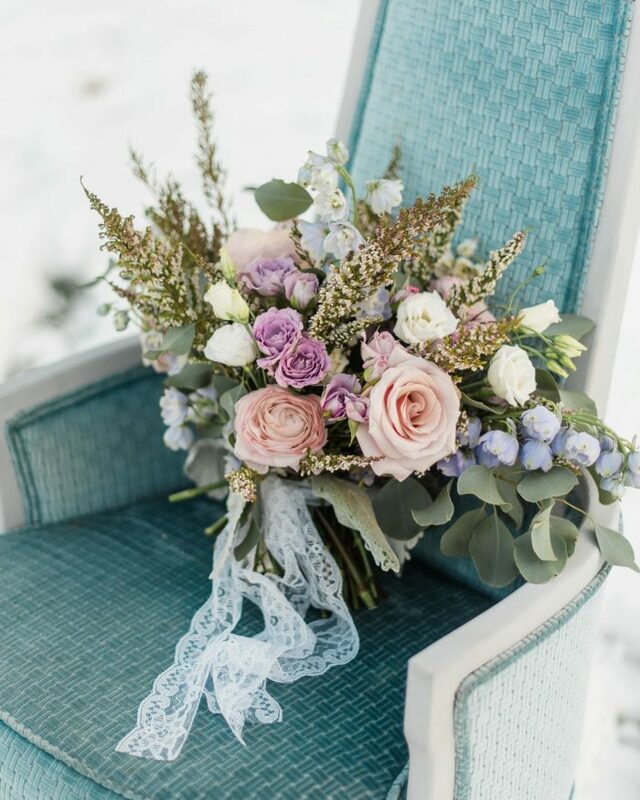 Two light blue high back vintage chairs save the place for the “bride and groom” – a real life couple who just got engaged! 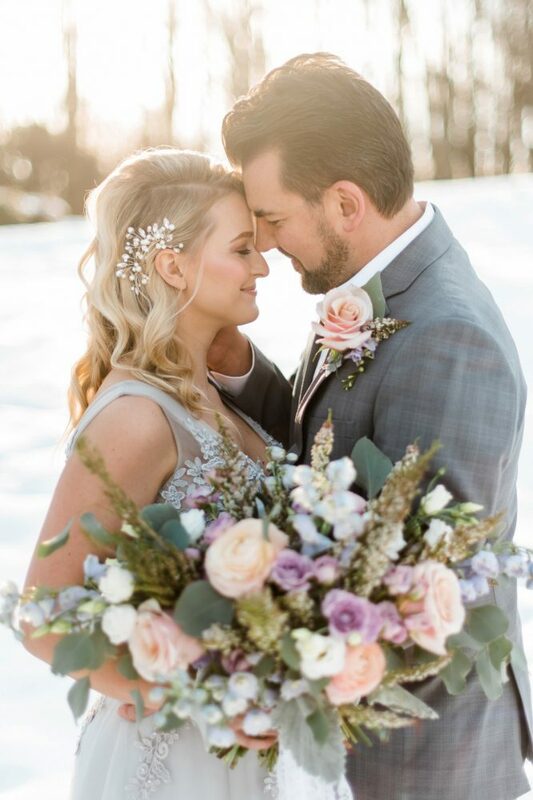 My favorite feature though? 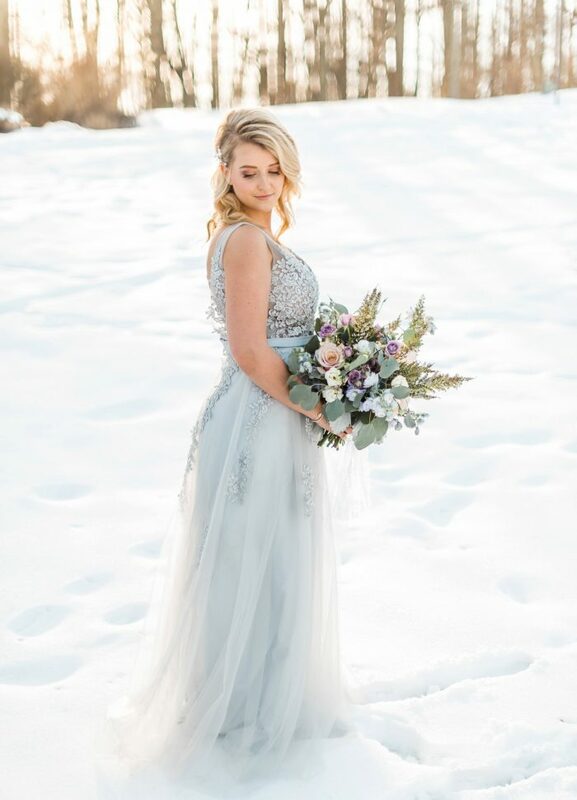 The V-neck icy blue dress with a lace bodice and tulle skirt worn by the model. 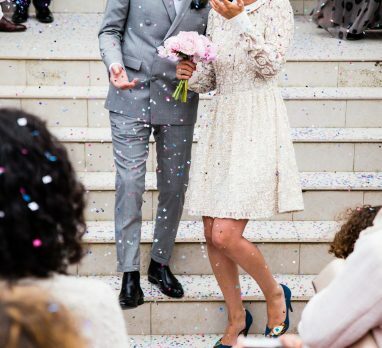 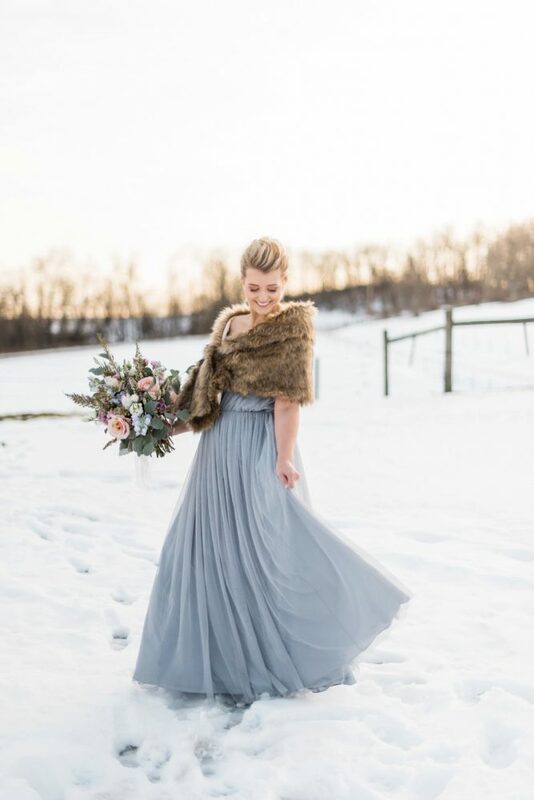 While a non-white wedding dress isn’t for the faint of heart, this gorgeous spin on tradition will win the hearts of even the most classic bride. 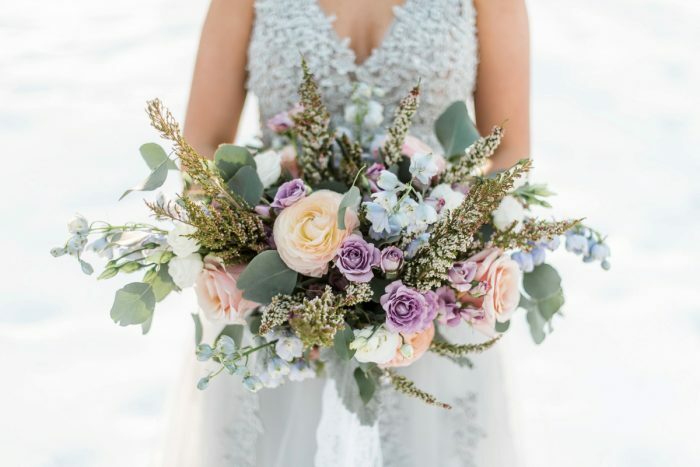 The dress paired beautifully with the lush bouquet created by Allison Brooks Events, which incorporated color, texture, and whimsical vibes. 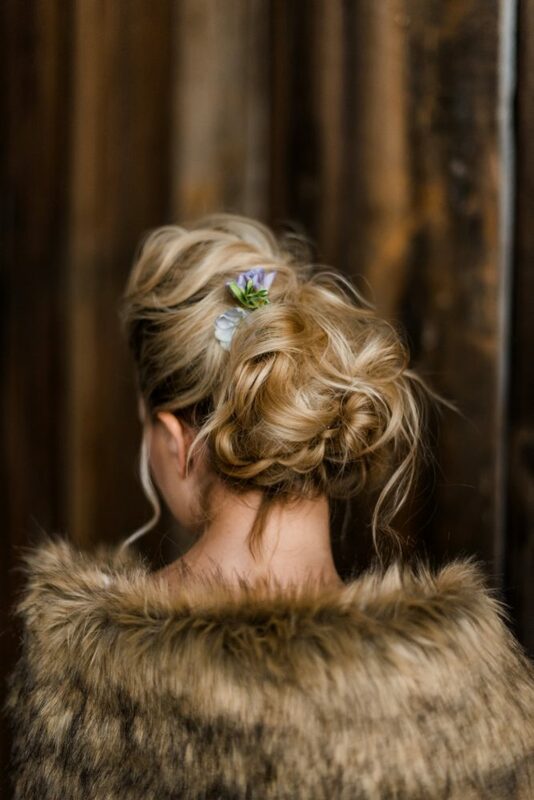 Soft hair by Glam to Go and natural makeup by Dominika Bronner completed the look. 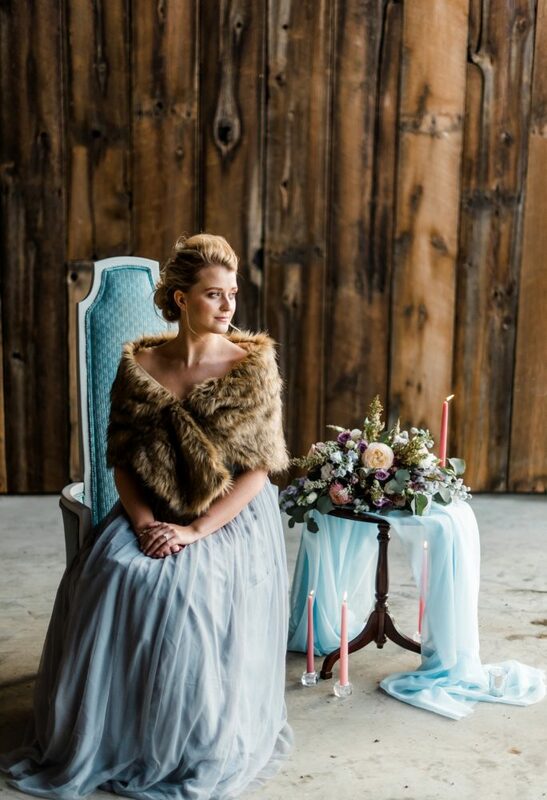 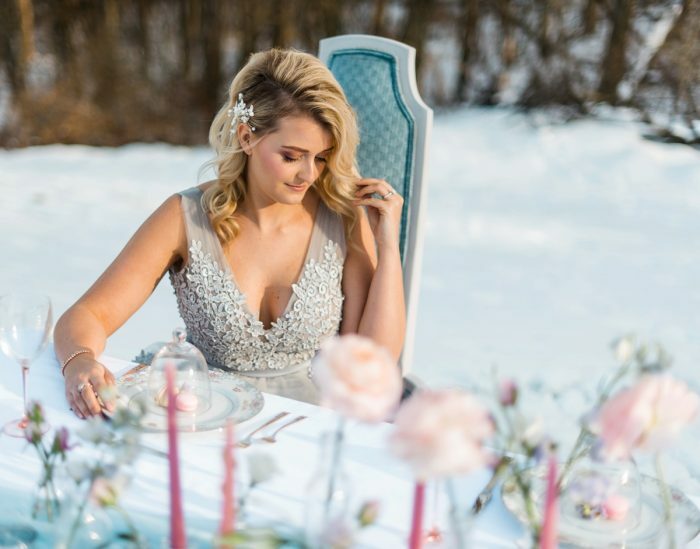 Captured by Dawn Derbyshire Photography, this styled shoot is sweet, girly, and a winter dream come true! 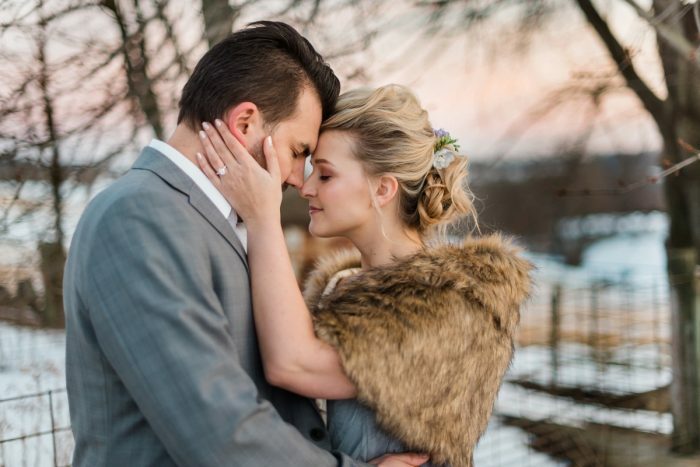 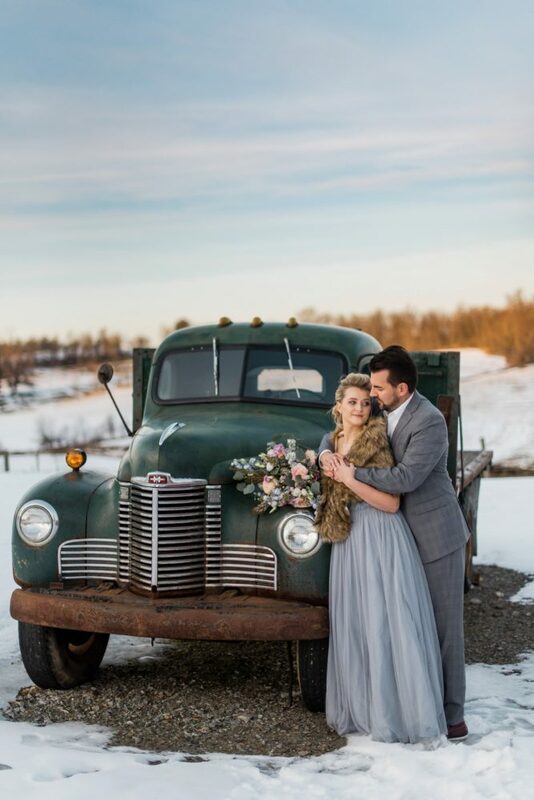 The inspiration for this shoot came about on a Monday evening after a winter storm. 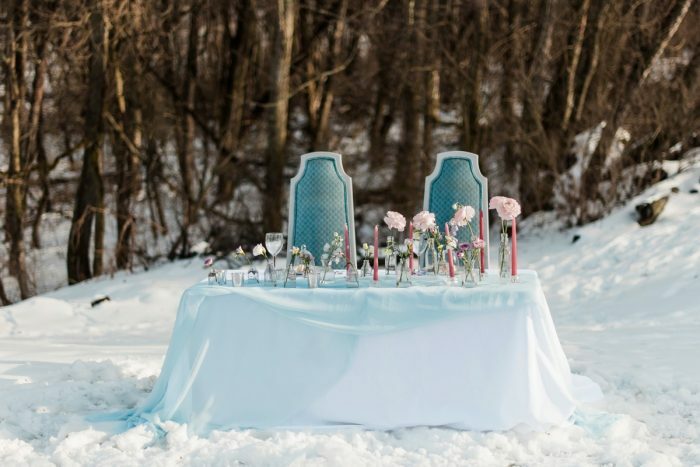 The sunset that night was a beautiful combination of pale blues and pinks that made me think of spring. 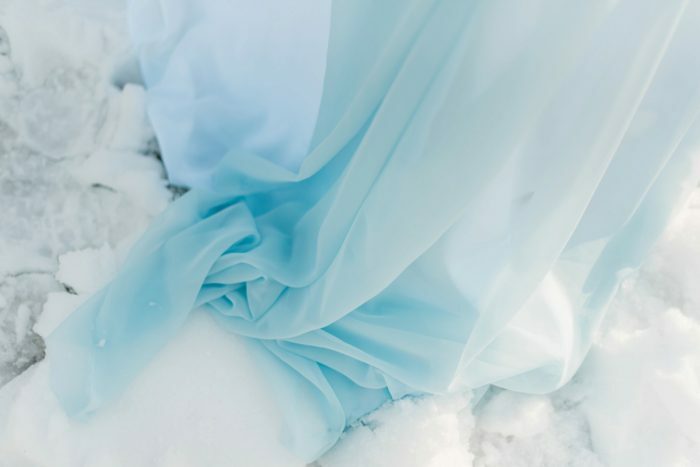 Typically with winter shoots, you see the use of bold colors to contrast the white snow. 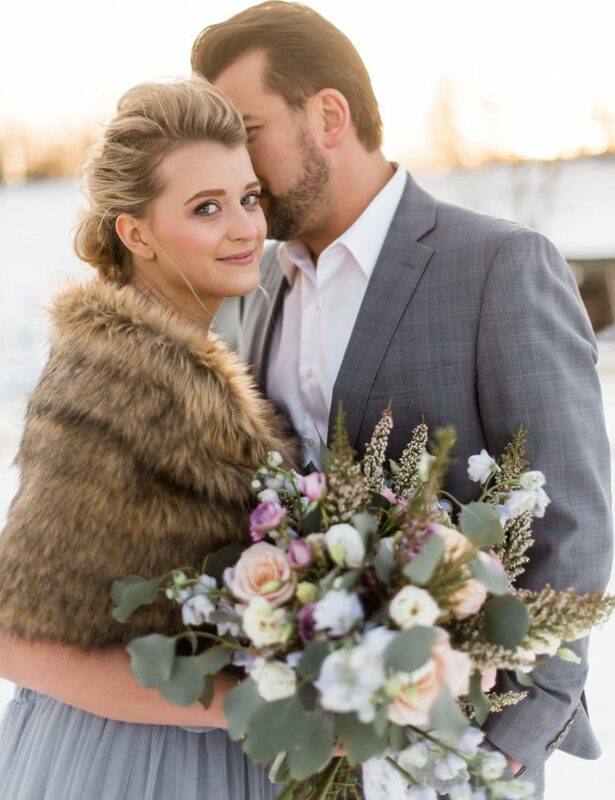 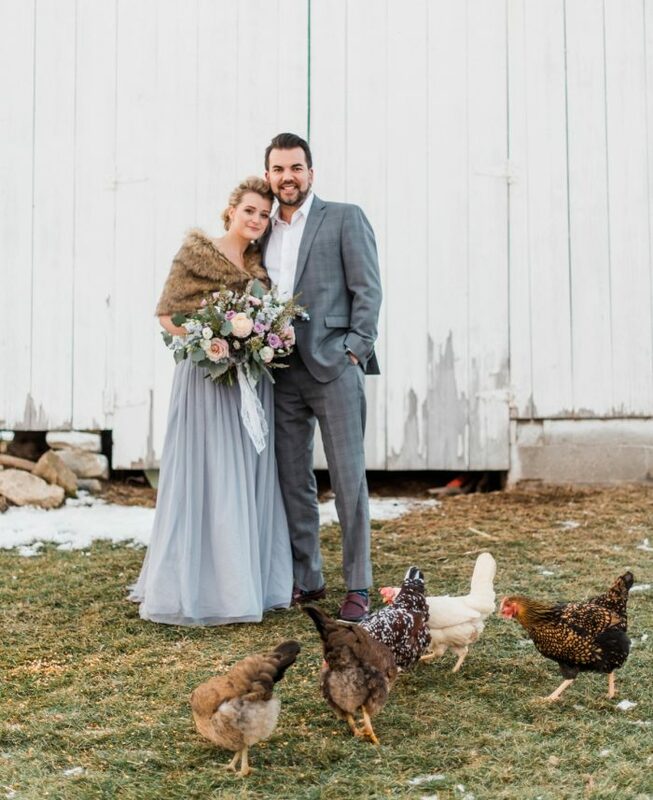 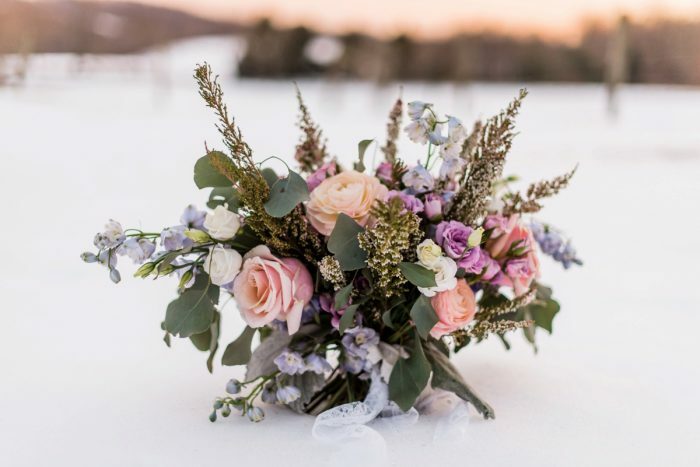 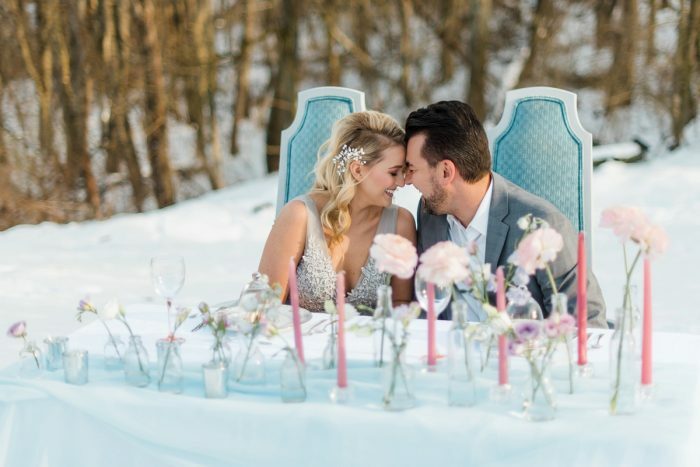 But I thought the pairing of this pastel palette with the winter environment would make for a sweet and whimsical take on a winter wedding. 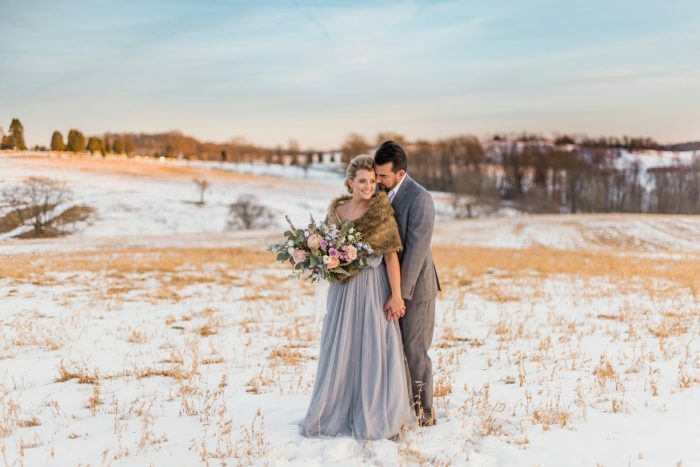 On Tuesday, with still just the start of an idea, I put out a message on Facebook to see who would want to do a spur-of-the-moment shoot that weekend. 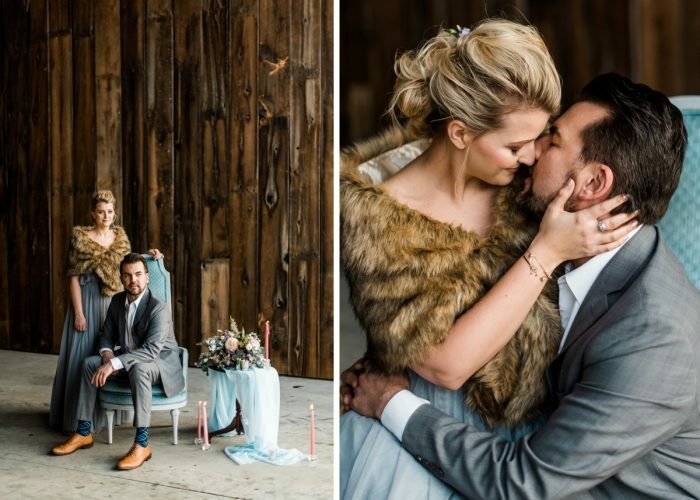 The result was an amazing team of wedding professionals who came together (most of them meeting for the first time!) 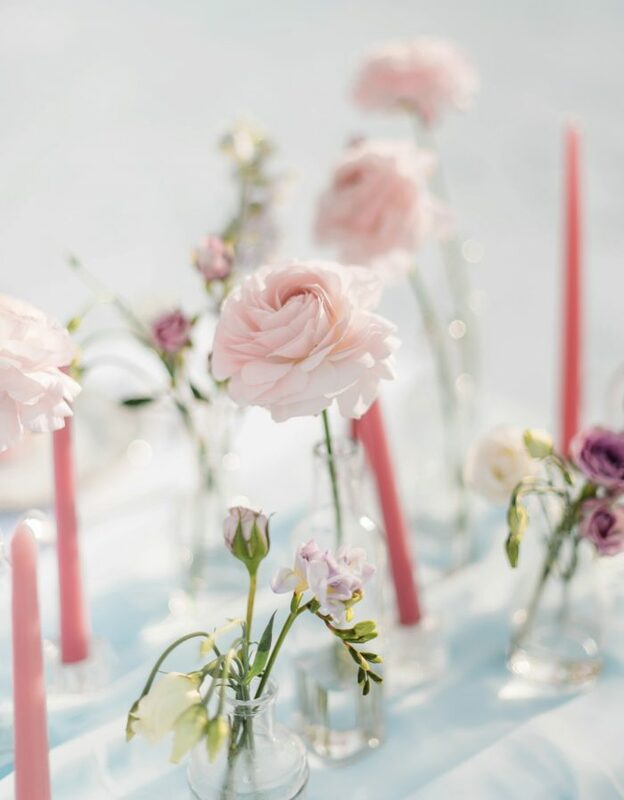 to make some magic. 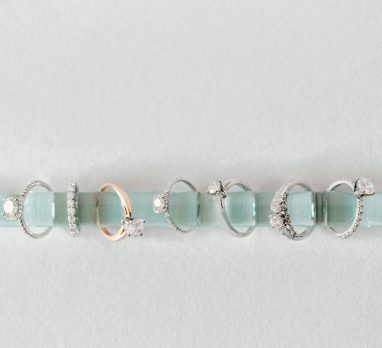 We all had a blast collaborating on this project – each one of us throwing out ideas when inspiration struck. Even our models – a real couple who were recently engaged – chimed in with ideas and helped with set-up! 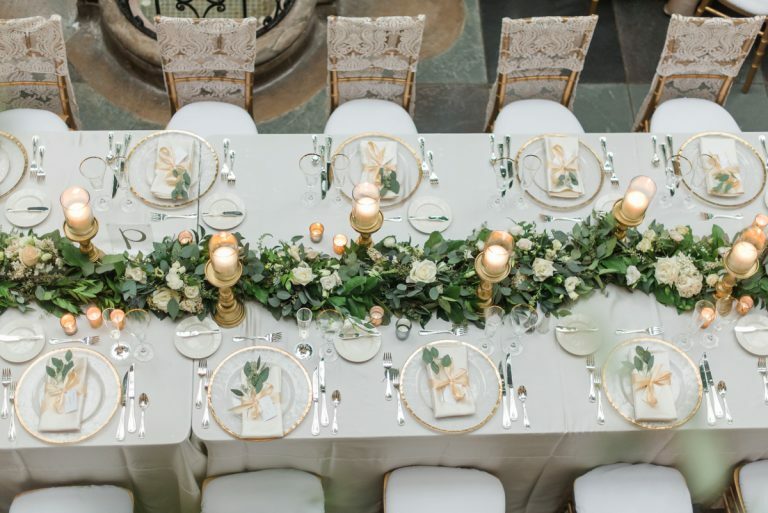 This whole experience was a prime example of the spirit of “community over competition” that makes Pittsburgh’s wedding industry so special! 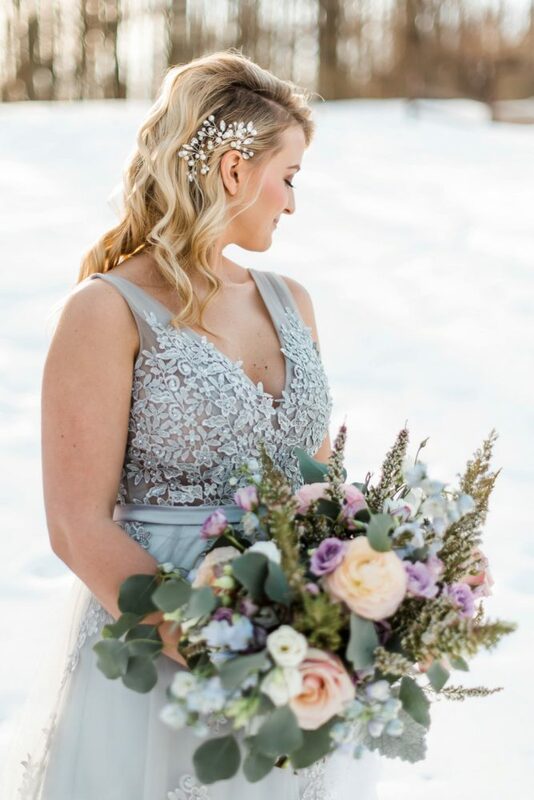 Other posts you might love!